The meters on our amplifi ers are different. They refl ect the current consumption of the amplifi er, and when the amplifi er is operating, they don’t go down to zero like the meters on other amplifi ers. This is because the electrical current consumption of our circuits has a fairly high value at all times, a property called the bias. The bias current runs through the amplifi ers at a minimum value, determining the class of operation – Class B, Class AB, or Class A. 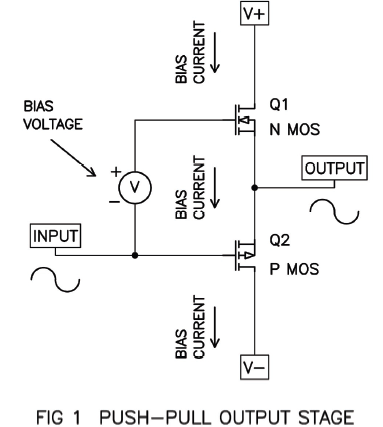 Class B has no bias current, Class AB has a moderate bias current, and Class A has a high bias current. Class AB push-pull amplififi ers are hybrids between Class B and Class A. Class AB run Class A at low power levels, and become Class B amplifi ers at output currents determined by the bias. For several years Pass Labs has specifi ed the nominal wattages at which our amplifi ers leave push-pull Class A operation into an eight ohm load. For starters, there is no special Class A circuit that kicks in and out, and for that matter, there certainly is no Klunk. There is just a push-pull amplifi er output stage which is operated at a constant idle current known as the bias. In this regard, our power amplifi ers are like other amplifi ers on the market. The vast majority of amplifi ers are push-pull designs with a certain amount of bias current. Push-pull amplifi ers generally operate in Class A mode up to a point where the output current is twice the value of the bias current. In the Class A region, both halves of the circuit share the signal simultaneously. Beyond that the signal is handled solely by the push (+) half of the amplifi er or the pull (-) half. Here we see two power transistors operated as “followers” where the output voltage equals the input voltage. Q1 is attached to the positive power supply and Q2 is attached to the negative power supply. Ordinarily the common output of these two transistors would be attached to a loudspeaker. When the input voltage is positive, so is the output voltage, and we would look to Q1 to supply current to the loudspeaker from the positive supply. When the input voltage is negative, we look to Q2 to supply current to the loudspeaker from the negative supply. Audio signal has both positive and negative voltage components and we will see a point at zero volts where the two halves meet. Unfortunately, all the gain devices we know have severe non-linearity (distortion) down around zero, and this gives us a very poor transition from Q1 to Q2 and vice versa. The solution for this is to apply some idle current to the circuit by the mechanism of the bias voltage source you see in Fig 1. This voltage is set so that at idle, current fl ows through Q1 and Q2 equally from the V+ supply to the V- supply and creates a more linear region at the crossover point. If that is not clear, perhaps an analogy will help: Imagine that the two transistors are runners in a relay race and that the signal is the baton they carry. In a real relay race, the runner receiving the baton begins running before the hand-off, which is made with the runners at speed. The runners who hand over the baton at a dead stop will operate at a severe disadvantage. So it is with push-pull power transistors. The higher the bias, the smoother, more seamless is the transition. 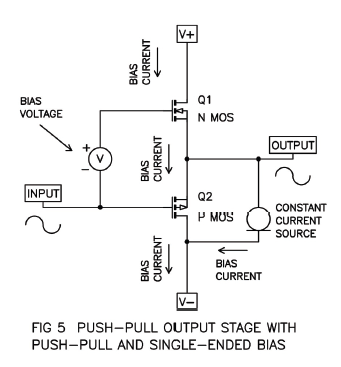 The quantity of bias current is the key. Figure 2 shows this from the point of view of Q1. 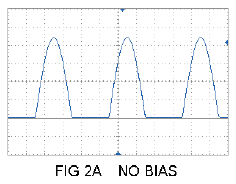 Fig 2a shows Q1 conducting current on the positive half of the signal and experiencing a sharp cutoff as the signal goes negative. 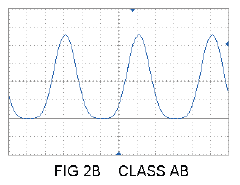 2b shows the effect of a small Class AB bias current – the current shows a gentle cutoff with less distortion. 2c shows enough bias to keep the transistor in the Class A region, where it always conducts current and has even less distortion. Higher bias doesn’t just move the Class A transition to higher ground – it has a profound infl uence on the amplifi er at all power levels. It lowers the distortion at low levels as well as high levels, as seen in the distortion vs power curves for an amplifi er with the bias set at different levels. In Fig 3 we see the distortion of an output stage operated without feedback driving 8 ohms from 0.10 watts up to 20 watts. 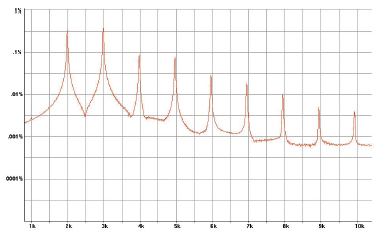 The top curve with the highest distortion has a bias of 0.016 amps. 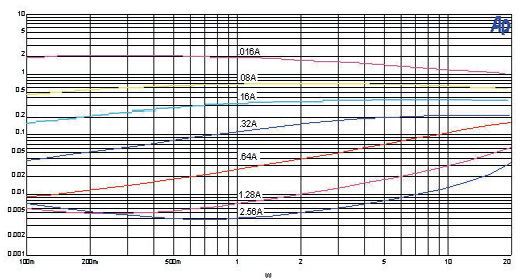 The next lower is 0.08A, followed by 0.16A, 0.32A, 0.64A, 1.28A, and the lowest distortion curve at 2.56 amps. What we see clearly is that higher bias lowers the distortion at all power levels, and that the distortion is inversely proportional to the bias current. Figure 4A shows the distortion at 1 watt with the output stage biased at 0.08 amps. 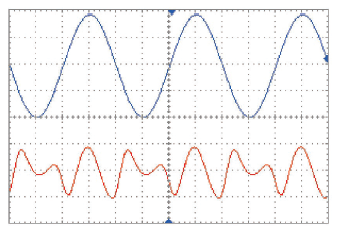 On the left you can see the signal waveform in blue and the distortion waveform in red. The distortion measurement is at 0.67% total, and you can see the harmonic distribution on the right, where harmonics from 2nd through 10th are prominent. Figure 4B shows the same test and output circuit, but at a 4 times higher bias fi gure, 0.32 amps. The distortion total has dropped to 0.11%, but of greater interest, the higher harmonics have been dramatically reduced, leaving a dominant 2nd order harmonic. At four times more bias in Fig 4C, the continues to drop to 0.004% (remember, this is without negative feedback), leaving nothing to look at on our distortion waveform and only 2nd and 3rd harmonic on the spectrum analysis. The benefi ts of high bias current extend beyond simple harmonic distortion measurements – you also get a reduction of intermodulation distortion (arguably more important), and a lower, more consistent output impedance. As a corollary benefi t, the heavy hardware required to support Class A operation will show better thermal stability and will deliver better performance into diffi cult loads. For a given amplifi er circuit, the idle dissipation is proportional to the bias current. Twice the bias current makes for twice the heat. Usually it also means about twice the hardware and twice the weight. Many products on the market have idle power draw at a small fraction of rated power. A Class AB 150 watt amplifi er channel with 0.1 amp bias will idle at about 10 watts. By contrast, an X150.5 channel has that power rating but idles at about 100 watts. The high performance of an X150.5 comes at a price. So far we have only talked about push-pull Class A bias. Do the effects of high bias also apply to single-ended Class A bias? Yes, but in a slightly different way. Single-ended Class A bias is where a single gain stage operates against some variety of current source, as compared to push-pull Class A where two complementary stages operate in opposition to each other. Single-ended Class A is often thought of as the “king of Class A” by purists because it delivers the lowest order of harmonic distortion, 2nd harmonic, instead of the 3rd harmonic of push-pull. In 1991 Pass Labs developed a hybrid class topology which paralleled a push-pull Class A output stage with a current source which biased it into single-ended Class A. The Aleph 0 amplifi er operated as a single-ended Class A amplifi er to its output rating of 75 watts into 8 ohms, and at currents beyond that it continued to deliver current as a push-pull Class A circuit. Subsequently in the X amplifi er series we retained a small amount of single-ended Class A bias on our output stage as a means of controlling the amount and character of the distortion at the lowest power levels – that all-important fi rst watt. By setting the value and direction of a single-ended bias current in a push pull power stage you can reduce the distortion by canceling the second harmonic nature of imperfectly matched Q1 and Q2 halves, or you can arbitrarily select a desired ratio of second to third harmonic, depending on subjective evaluation of the resulting sound.Figure 5 shows a simple example of such a circuit. We apply a single-ended Class A bias at about 10% of the push-pull Class A bias. This is suffi cient to improve the performance around 1 watt and below. 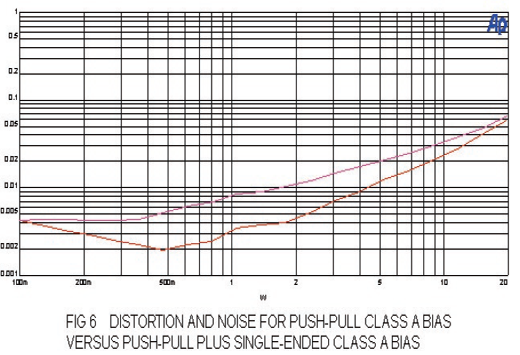 Fig 6 shows the distortion plus noise (again without feedback) of the earlier example output stage with a 2.56 amp push-pull bias and also with an added 0.5 amp single-ended bias. You can see a distortion improvement by roughly a factor of 2 in the low wattage region. Below 0.5 watts, you can also see the noise which is the same in both circuits. Like all bias decisions, the amount of single-ended bias and push-pull bias is a balance between performance and effi ciency. The bias is generally set at a level suited to the heat dissipation capacity of the hardware. At Pass Labs the bias is set to the value which raises the heat sinks 25 – 30 degrees C. above ambient temperature. The result is a heat sink which you can put your hand on for about 10 seconds or so. As a practical matter, this means that our X (Class AB) amplifi ers are biased to dissipate roughly half of their rated output power. The XA (Class A) amplifi ers are biased to dissipate roughly three times their rated output power. The whole point of going to this trouble is to build an amplifi er which sounds as good as possible. We fi nd that this is achieved by building a simple amplifi er which is intrinsically distortion-free. Getting that depends on a high bias. Measurements are helpful at illustrating the differences between design approaches, but they are certainly not the last word in audio. If they were, then numerous other approaches would sound as good or better. You can certainly imagine an amplifi er which operates with a low bias current but has the necessary amount of negative feedback and/or circuit complexity to insure that it measures as well. Actually, you don’t have to imagine it – such amplifi ers are for sale. Do they sound better? We don’t think so. Our meters don’t go to zero.